A Chinese foundation has announced an ambitious plan to take its tree conservation projects beyond China’s borders to nations along the Belt and Road, partly in answer to concerns over massive infrastructure projects in arid areas. Can it take root? The Euphrates poplar is not a well known tree species outside of the desert areas in which it grows in Central and South Asia. Yet the tree, with its twisted and gnarled branches which briefly flares into a riot of golden leaves in fall, may just form the backbone of a major multinational ecological restoration project, if environmentalists from a Chinese organization can garner enough support, domestically and overseas. To address similar environmental concerns, in May 2017, the Chinese government issued a document titled Guidance on Promoting a Green BRI, which clarified that China would incorporate green development into major Belt and Road projects. For outsiders, it is unclear how the green initiative will progress on the ground. Accordingly, to solidify the ideas behind the Green BRI, in September 2018, the China Green Foundation (CGF), a quasi-NGO affiliated to China’s National Forestry and Grassland Administration, announced the launch of an ambitious plan to extend its program of Euphrates Poplar (populus euphratica) forest restoration to countries along the Belt and Road, with the CPEC as one of its three key restoration belts. riparian forest that adapts well to arid environments, it is distributed from North Africa, across the Middle East and Central Asia to western China. It grows along the banks of rivers or on land that is seasonally flooded, and plays an important role in stabilizing vulnerable ecosystems in arid zones. However, due to over-exploitation as a main source of firewood, forests of this species have largely disappeared or became fragmented during the last century. According to Bhawani Shanker Kusum, President of NGO Gram Bharati Samiti based in Jaipur, India, despite being an ancient and endangered species, it has tremendous ability and capacity to form forests in inland river basins located in arid lands. It is an essential component of desert riparian ecosystems. “It forms a natural eco-barrier that protects the development of oases, stabilizes river channels, maintains the ecological balance of river basins and helps in forming fertile forest soil,” Kusum told NewsChina through a recent email interview. Statistics released by the China Green Foundation indicate that the global Euphrates poplar forest area is 648,000 hectares, with the largest remaining natural distribution in China and Kazakhstan. China’s existing Euphrates poplar forest area is 395,000 hectares, which mainly grows in five northwestern provincial regions, including Xinjiang Uyghur Autonomous Region, Inner Mongolia Autonomous Region, Ningxia Hui Autonomous Region and Gansu and Qinghai provinces. “As this species is native to China and Pakistan, and grows particularly well in semi-arid conditions, P. euphratica is a potentially promising candidate for combating desertification in the proposed region,” Kabraji said. It can also survive in saline soil to encourage the growth of more economically valuable species like kikar, a small thorny tree of the acacia family. Apart from its ecological value, the wood can be used for house-building and furniture-making, and provides ingredients for traditional medicine. Areas with Euphrates poplar forest have also become popular tourist destinations, particularly in the fall, when their leaves turn a golden color. Local communities, some of which are in marginal, remote areas, benefit from the extra income the forests bring. 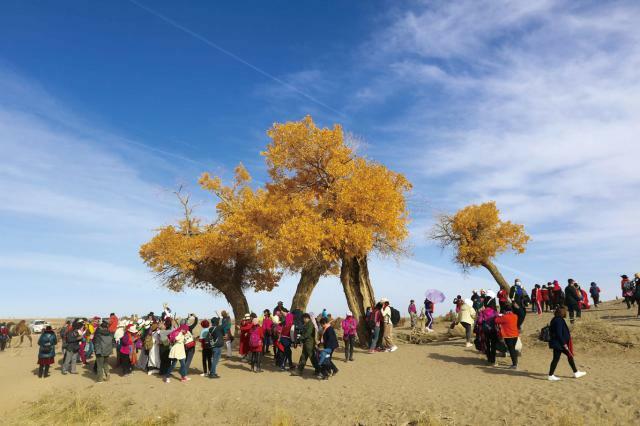 Tourism income generated by the Euphrates poplar forest in Ejina Banner, Inner Mongolia in 2018 has been calculated at 5.74 billion yuan (US$825m). Professor Li Junqing of the College of Forestry under Beijing Forestry University is the lead author of the restoration plan. He cautioned that not everywhere is suitable for re-greening with the Euphrates poplar. The best habitat is riparian arid land with seasonal flooding and annual precipitation of above 39 millimeters. “Even though its root system can delve deep into the soil, the groundwater resource it needs should not be lower than two meters,” Li said. Efforts to conserve China’s Euphrates poplar forests started in the 1980s. 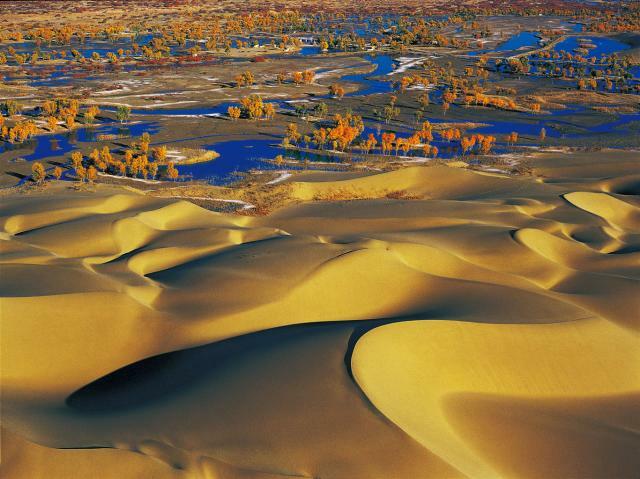 There are now four major national nature reserves involved in conservation in Xinjiang, Inner Mongolia and Gansu, Li said, which has effectively prevented their eradication from deforestation and overgrazing. Since the beginning of the century, there have been regional water diversion projects to direct water to a number of inland river basins, which has relieved water shortages in some of the reserves. Local environmental authorities have started conservation schemes for Euphrates poplar forests in river basins such as the Tarim River in Xinjiang and the Shiyanghe River in Gansu. 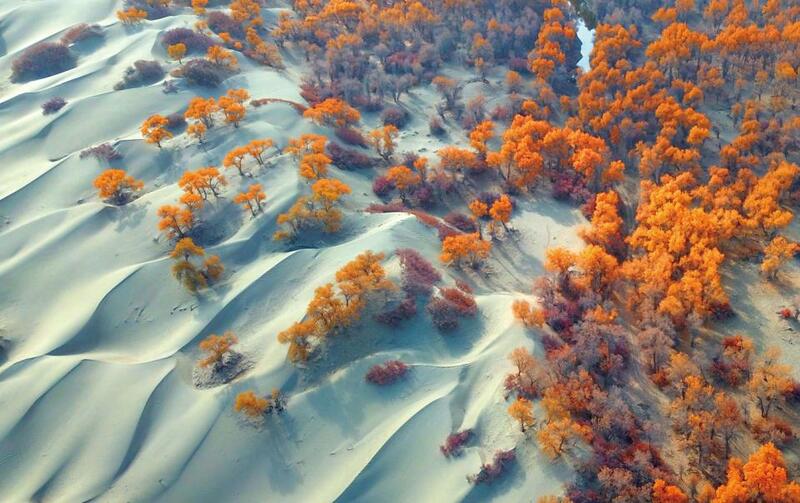 Since 2015, Minqin in Gansu, which has been afflicted by severe desertification, started a scheme to plant an area of 666 hectares of Euphrates poplar, which is scheduled to be complete in five years. So far, according to local data, over 560 hectares of trees have been planted with a survival rate of up to 90 percent. In the past, the poplars of Minqin were distributed on both sides of the ancient riverbed. But as groundwater resources significantly declined up to the end of the last century, the distribution of the species has decreased significantly. Ma Junhe, a Minqin local and the founder of the Saving Minqin Volunteers Association (SMVA), works on anti-desertification projects by organizing local communities to plant saxaul, a desert shrub which is effective in preventing erosion and restoring desert land. Ma told NewsChina that compared with other desert plants such as saxaul and rose willow, the Euphrates poplar requires more water and care to survive. Professor Li also cautioned that in very arid areas, a better approach is to avoid monocultures and mix the Euphrates poplar with other desert plants, including rose willow and saxaul. “It is urgent to preserve the existing poplar forest and putting to halt to any human damage, and second, for places where poplar used to grow but has died out, the primary task is to know exactly why it died before taking any further reforestation steps,” Li said. Kabraji agreed, saying that multiple species are required for multiple ecosystem services and benefits rather than depending on a single species. According to Chen Meina from the China Green Foundation, a local restoration project that aims to plant one million Euphrates poplar trees in Luntai in central Xinjiang is scheduled to start in 2019, and the China Green Foundation, according to Chen, is supporting the Luntai project to the tune of 27 million yuan (US$3.88m), most of which is to be raised through crowdfunding. Another even grander reforestation project of 66,600 hectares to include the Euphrates poplar tree in Aksu, on the northern edge of the Tarim basin in Xinjiang, already started in early 2018. Other countries explored the Euphrates poplar’s economic and ecological value earlier than China. Kusum said that in 1987, the species was successfully introduced to parts of India to explore its potential for mitigating the fuel and fodder crisis in semi-arid and arid regions. Another reason was to cover uncultivable sandy wastelands. “Asia contains some 1.7 billion hectares of arid, semi-arid and dry sub-humid land. It includes expanding deserts in China, India, Iran, Mongolia and Pakistan, the sand dunes of Syria, the steeply eroded mountain slopes of Nepal and the deforested and overgrazed highlands of Laos,” Kusum said, who added that projects to restore the Euphrates poplar were relevant for India. “So far some countries including Pakistan, Kazakhstan, and Kyrgyzstan in Central Asia have expressed interest in poplar restoration,” said Chen Meina, who is in charge of the Green Foundation’s poplar projects. “Given its visual beauty, this tree is a powerful communication symbol to promote protection and restoration of riparian forests in temperate regions of Asia,” Simonov said. But he stressed that in many areas of Central Asia, the ecological role the Euphrates poplar has in Xinjiang is carried out by different species, including other poplars, the Russian olive, ash, tamarix and sea buckthorn. In the meantime, Kabraji cautioned that ecological and social assessments in each landscape should be carefully carried out before attempting any reforestation project, since not all drylands actually require restoration. “Tree planting is not always a good thing... in many dryland situations, grassland restoration may be more appropriate than tree planting,” Kabraji said. In 2019, the China Green Foundation would like to expand its domestic poplar restoration schemes to other countries, and would like to collaborate on two pilot projects along the Belt and Road to start with. It has even grander ambitions – to have three Euphrates poplar ecological restoration belts by 2030 – one in Northwest China, one along the China-Pakistan Economic Corridor and another along the China-Central Asia-West Asia Economic Corridor, assuming other countries are willing to get on board. Nevertheless, the organization has already started promoting its international vision. Kusum told NewsChina that he applauds the Green Foundation’s ambitions. “It is very close to my dream project,” he said.